Whether your are storing very fragile items or regular bulk storage within hospital and laboratory environments, our Rousseau products can help you find the “right fit” to your organizational needs. Our products improve inventory and space efficiencies while storing more in a small space. 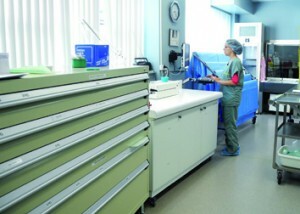 Items ranging from surgical kits to office and cafeteria supplies can be stored with the Rousseau system. When you combine steel shelving with lockable glass doors, you protect your valuable and fragile items from theft, while also keeping your inventory free of dust and dirt. Our Rousseau products have a functional solution for your maintenance technicians that facilitates moving items from where they are stored to where they are needed. For office needs such as filing, storage of office supplies, patient and client record storage and archiving, our systems offer a line of versatile and attractively designed storage products that are equipped with a wide range of accessories.